Paramecium tetraurelia is a very large (120 micrometers) eukaryotic cell covered with vibrating cilia. It is a unicellular organism. Paramecium is an organism which is both unicellular and complex, making it an excellent model for the genetic study of numerous differentiated functions in multicellular organisms often absent in simpler eukaryotes such as yeast. 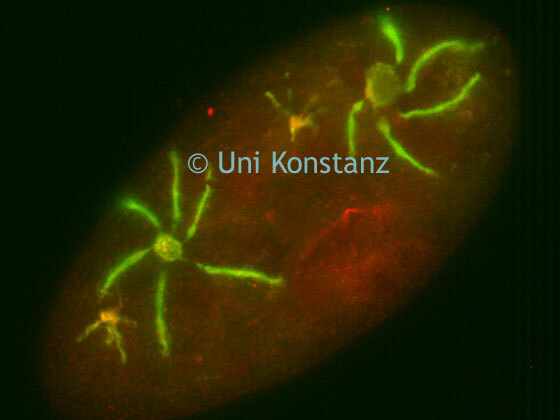 Image of cilia of the paramecium tetraurelia captured with Jenoptik C3 microscope camera. The cilia are the tentacles and cover the cell completely enabling the organism to swim and capture its food, consisting mostly of bacteria.